Some observers argue that the current problems in the Eurozone are actually the result of a monetary crisis not a sovereign debt crisis. They acknowledge there are structural problems with European currency union but point back to the failure of the ECB to stabilize and restore nominal spending to expected levels during the crisis of 2008-2009 as the real culprit behind the Eurozone crisis. This failure to act by the ECB--a passive tightening of monetary policy--has been devastating because it means nominal incomes are far lower than were expected when borrowers took out loans fixed in nominal terms. European borrowers, both public and private, are therefore not able to pay back their debt and the result is a fiscal crisis. But it gets worse. The reduced ability for Europeans to payback debt also means that risk premiums on countries with lots of debt or ones perceived to have debt problems increases, further raising these country's debt burden with higher financing costs. The fiscal crisis gets bigger, and being easy to observe, gets wrongly credited as the cause of the Eurozone's problems. Consequently, the Eurozone crisis is prescribed with the fiscal solution of austerity. The real solution, however, implied by the monetary view of crisis is restoring nominal incomes to their originally expected values. Thus, David Glasner argues that "Europe is having a NGDP crisis not a debt crisis" and Ambrose Evans-Pritchard claims that the Eurozone crisis "is a monetary crisis caused by a jejune central bank [.]" 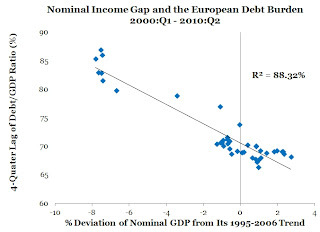 This figure shows a remarkably strong relationship between (1) the deviation of nominal income from its expected level and (2) the growth of the debt burden lagged by four quarters. Thus, if European nominal incomes are less than expected then eventually higher debt burdens increase for the reasons outlined above. Now lest you think the strong relationship is simply the result of nominal GDP being in the denominator of the the debt burden measure take a look at the following figure. 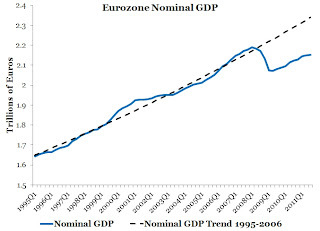 It shows actual nominal GDP for the Eurozone and its trend for 1995:Q1-2006:Q4 which are used to construct the percent deviation of nominal income from its expected level in the figure above. The trend provides an indicator of what nominal income growth expectations were prior to the 2008-2009 crisis. So yes, the Eurozone crisis is a monetary crisis, a crisis catalyzed by the failure of the ECB to stabilize and restore nominal spending to its expected level. Again, though, there are longer-term structural and political problems with the Eurozone that arguably are behind the monetary crisis. Still, if the Eurozone experiment is to be salvaged, then a proper monetary diagnosis of the current crisis has to be realized so that the currency union can survive long enough for it to be salvagable. Take a look at the average fiscal deficits of 12 significant (or at least revealing) eurozone members from 1999 to 2007, inclusive. Every country, except Greece, fell below the famous 3 per cent of gross domestic product limit. Focusing on this criterion would have missed all today’s crisis-hit members, except Greece. Moreover, the four worst exemplars, after Greece, were Italy and then France, Germany and Austria. Meanwhile, Ireland, Estonia, Spain and Belgium had good performances over these years. After the crisis, the picture changed, with huge (and unexpected) deteriorations in the fiscal positions of Ireland, Portugal and Spain (though not Italy). 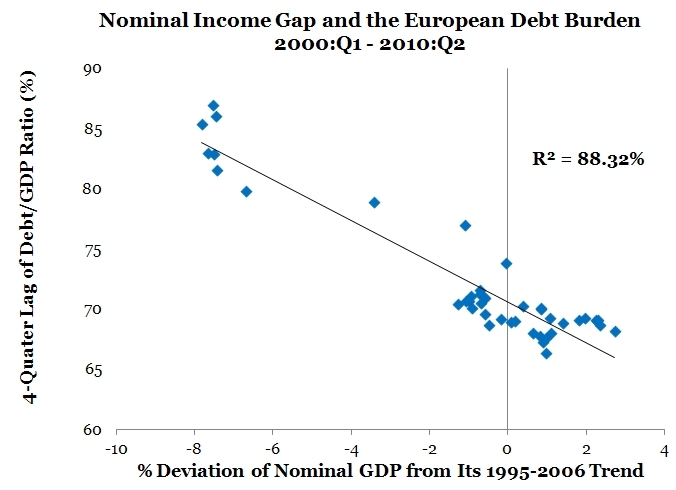 In all, however, fiscal deficits were useless as indicators of looming crises (see charts). Now consider public debt. Relying on that criterion would have picked up Greece, Italy, Belgium and Portugal. But Estonia, Ireland and Spain had vastly better public debt positions than Germany. Indeed, on the basis of its deficit and debt performance, pre-crisis Germany even looked vulnerable. Again, after the crisis, the picture transformed swiftly. Ireland’s story is amazing: in just five years it will suffer a 93 percentage point jump in the ratio of its net public debt to GDP. So most of the fiscal problems are a result, not the cause, of the Eurozone crisis. 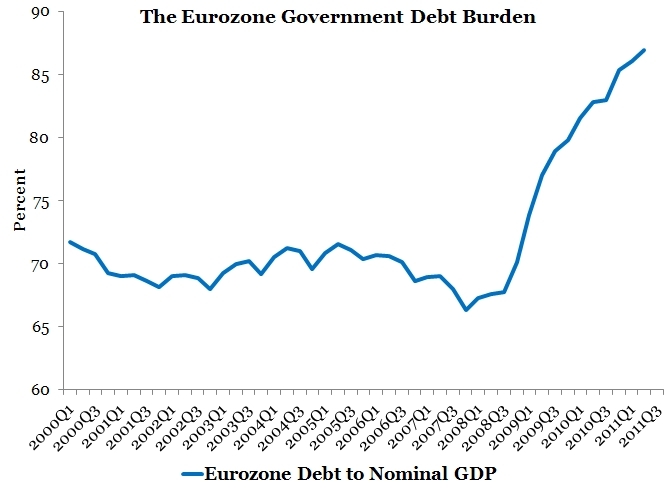 Update II: Ezra Klein also shows that the Eurozone crisis at its core is not a debt crisis. Naturally, I agree with your argument. 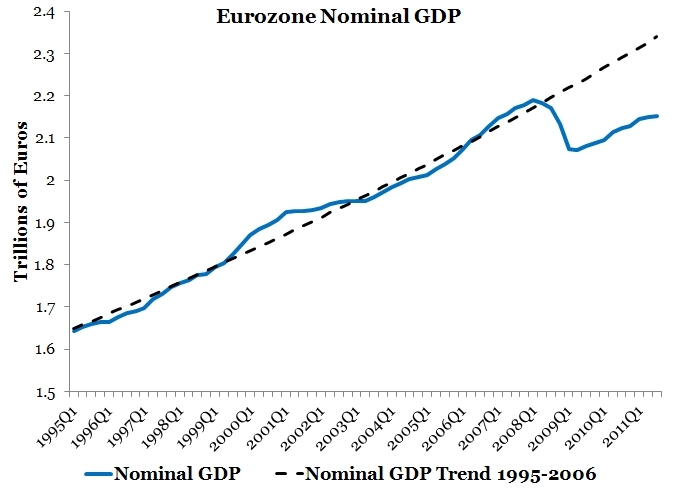 The ECB should be keeping nominal GDP on a stable growth path. The substantial drop we observe will naturally make public and private debt payments more difficult. So, how would one respond? Inflation targeting is being acheived, more or less, and it is appropriate because creditors should bear no real risk. Nominal GDP targeting, on the other hand, means that creditors bear risk from supply side shocks. It is better for those risks to be covered by debtors--taxpayer-workers and taxpayer equity investors. And given this scenario, or perhaps some view that nominal GDP cannot be controlled, then drops in nominal GDP is just one of those risks that debtors for which debtors must be prepared. And so, they should keep national debts lower relative to tax receipts and have less leverage. Please Mr. Bernanke and ECB'ers, read this stuff. 1. A economic downturn - one of the symptoms of which is a fall in NGDP away from growth trend. 2. 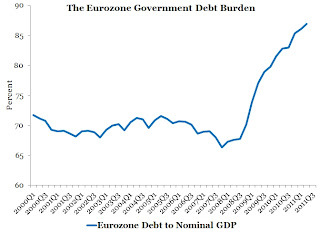 A sovereign debt crisis in Europe - the root causes of which are past borrowings by governments based on an expectations that NGDP (and tax revenue) would be much higher than they turned out to be , combined with the inability of CBs in the euro zone to monetize their own govt debt. I am very worried about a "solution" that amounts to the ECB increasing the supply of Euros (presumably by QE ?). This solution cannot fail to raise NGDP but it will also bail out the bloated governments whose borrowings have sucked the life out of their national economies and whose polices have caused the supply of labor to be unresponsive to economic signals. Is this a solution worth implementing or is this just inflating our way out of this jam and onto the next crisis? Many of the "bloated governments" became that way because of the crisis, not because they were inherently profligate. This only became a wide-scale fiscal crisis after the fact. Are you saying because central banks cannot always stabilize NGDP for political reasons countries should therefore run extra austere fiscal policies as a hedge against a fiscal crisis emerging? Not really. They should just target NGDP. I was trying to understand how everyone else sees it. "Inflation targeting is being acheived, more or less, and it is appropriate because creditors should bear no real risk." No, it isn't. Inflation expectations for the Eurozone are actually very low, especially those 2 to 5 years out. See e.g.   . And even assuming that the ECB is politically constrained to pursuing price stability, price-level targeting would lead to better outcomes. As far as I can see many EU countries (including the PIIGS) had close to 3% budget deficits , and some had total government debts close to (or even above) 100% of GDP. That was when things were supposed to be sustainable based on future growth expectations ! Am I only the only one that finds that scary ? I prefer a smaller state involvement in the economy too, but that is a different question then asking why did the fiscal crisis erupt? Yes, some of the countries had long-term fiscal problems just like we do prior to the crisis, but they were not facing an imminent threat of default until the ECB allowed nominal income to fall. I agree that had the ECB kept NGDP on its previous growth path then it would probably have prevented the fiscal crisis from breaking out. However I am questioning if that would have been a good thing. 1. It would have allowed a bunch of profligate states (who essentially failed to plan appropriately) to escape unscathed). 2. At a more fundamental level given the moribund state of the business sector and rigidity in the labor markets in many of the PIIGS I do not see how increasing the money supply will increase business investment and raise real GDP. More likely it will just boost state spending again and lead to higher inflation in the euro-zone (BTW: its already running at 3% http://www.reuters.com/article/2011/11/30/eurozone-inflation-idUSB5E7JV00H20111130, shouldn't it be lower than that if your analysis on NGDPT is correct?). We agree then that longer-run viability of the Eurozone from the get go was suspect at best. The periphery was never a good fit from the start with the austere core and I have a hard time seeing how they would ever change enough to meet German standards. This is excellent!! Hope the ECB World read it! "European borrowers, both public and private, are therefore not able to pay back their debt and the result is a fiscal crisis." If memory serves, the crisis began when Lehman blew up. Apparently it was not holding enough "safe" assets when the price fell out. What ensued was a credit crunch. Inter bank lending froze, then availability of credit blew up for both public and private borrowers. The resulting deflationary forces put folks out of work and devalued their home equity. So, yea, then no one could pay back debt without a job as nominal wages would not have improved as fast as the crisis ensued. And only after the credit freeze took everything down with it. Such is reliance on a free banking system that does not have Fed Reserve backing, until, of course, it needs it in the form of unlimited asset purchases to stoke nominal GDP by making risky assets "safe" once again. There is a reason creditors have a lender of last resort, and need one. The Fed is having a very difficult time stoking inflation and bringing down employment even with massive unconventional easing and a waning belief in QE's inflation expectations.Japan was not very successful, either. As what they say the best way to solve the problem is to know what causes it.Both possible cause had been presented with some supporting details that's why it is quite hard to figure out whether it is a result of a monetary crisis or a sovereign debt crisis. What Really Caused the Crisis? Which Graph Best Summarizes the Eurozone Crisis?